Featuring: Giulietta Masina, Francois Perier. Director: Federico Fellini. Giulietta Masina's face is so expressive it seems as though it was in her DNA to perform in silent films. I don't know if she ever was in any silent films or not, but every time I see her in a movie I just picture her with Charlie Chaplin hamming it up and holding conversations with just their facial expressions. She seems to be from another time. A time when theatre was more important than the silver screen. Her energy, her deliberate awkwardness. I can't tell if she was brilliant or an idiot savant, but what I do know is that I absolutely cannot keep my eyes off of her. 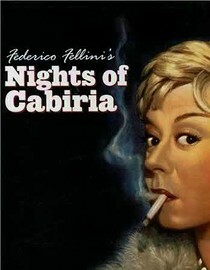 Nights of Cabiria again pairs up Masina with famed Italian director Federico Fellini, himself a bit of an odd bird. Together they tell the story of a prostitute who is jaded enough to expect those around her to hurt her, but hasn't yet reached the level of cynicism that keeps her from being hopeful of finding true love. As you can probably imagine, she's right in that sweet spot where she get hurts a lot. Masina, and by extension her character, has such a great spirit that somehow this movie keeps from devolving into a depressing mess. You want to follow her journey, you want her to succeed, even if you sort of suspect it's just going to turn bad in the end. After all, part of me thought she sort of suspected it as well. Queue this one up, it's a ride worth taking and at the very least you can come back and tell me what you think of the enigma that is Giulietta Masina. There is just something about her I can't quite put my finger on. Why is it in your queue? I watched La Strada a while back and I became interested in Fellini and incredibly intrigued with Giulietta Masina. Plus, just look at that poster. Awesome. Is it artsy? It doesn't feel artsy but I guess it sort of is. It is in Italian. What stood out the most to you? Giulietta Masina has the most expressive face I've ever seen in my life. What mood should I be in to watch this movie? In the mood for something different.